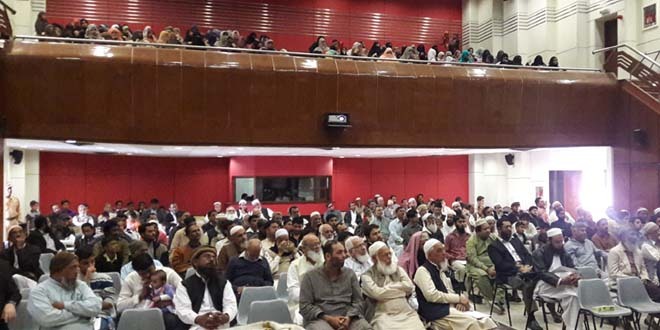 Karachi, 30 December 2015: PIMA Tarbia Karachi arranged Islamic Study Circle program at Rangoonwala Hall on 20 December. Certificate were also distributed among the 200 participants of Quran Fehmi classes, which were held on 10 different places of the city. The guest speakers of the ISC program were Engineer Muhammad Usman and Mufti Ahmad Afnan, who delivered keynote talks on “Balance in stinginess and extravagance” (بخل اور اسراف میں توازن) and Importance of “independent reasoning” in current scenario (دور حاضر میں اجتہاد کی اہمیت) respectively. Male and female doctors and medical students attended the session in large number. Audience listened to talks with keen interest and got the guidance in the perspective of Quran and Hadith.